Here are the seventh and eighth episodes concerning criminal investigations in Paris by Alice, a twenty-six year old French psychologist, and Conrad, a South African pensioner in his late sixties. 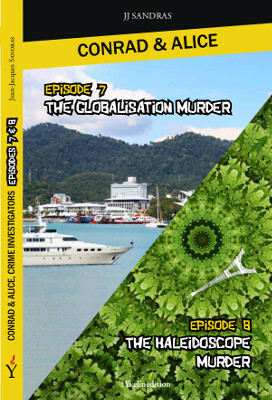 - In the seventh episode Alice introduces Conrad to one of her patients who, after living comfortably for several years in Malaysia, has recently returned to France because conditions over there for ex-pats changed dramatically due to globalisation. Yet his psychological problem is due to something worse and Alice suspects that he is hiding some vital information concerning a murder on a yacht in the Philippines. Once again, our two investigators find themselves involved in a murder riddle and end up by helping the police solve the case. - In the eighth episode Alice invites Conrad to meet one her patients overcome by losing his beloved who prefers what she learnt in an ashram in India to him. She disapproves his lack of interest in mysticism. The ensuing philosophical discussions between our crime investigators, the forlorn lover, his ex-girlfriend and one of their acquaintances reveal an unexpected murder. Once, again our two investigators find themselves involved in a murder riddle and end up by helping the police solve the case.